Book Ani Villa South if you need a family friendly, wheelchair accessible vacation rental. This 6-bedroom villa is ultra modern both inside and out. There’s also a personal concierge who works with you to plan your activities and food before you even arrive, and customized beach service! You’ll love the gym, tennis court, event pavilion, and full staff. Ani Villa South is a luxurious six-bedroom villa on a private region of Anguilla. Perched on the edge of a cliff, this fully staffed, five star villa has every amenity under the sun. This villa has a heated infinity pool, a cliffside hot tub, a rooftop terrace, and al fresco dining. The villa’s butlers will set up gourmet meals and lounging areas on the beach of guests’ choosing, and guests can also enjoy poolside service. Ani Villa South is wheelchair accessible, with an elevator, roll-in showers, pool lift, and more. Guests can stay entertained in the game room, which is fully equipped with billiards, shuffleboard, a Wii, and board games. There’s a fully-equipped kitchen that the chef will use to prepare daily breakfast and either lunch or dinner, and a formal dining room to enjoy meals in. For special occasions, the Estate’s shared events pavilion can be set up for a 30-person sit-down dinner or a 150-person cocktail party. All six bedrooms have goose down comforters, private balconies, and ensuite bathrooms. There’s a Garden Suite on the lower level, with a living area and two twin beds that can be made up as a king. On the ground level, there’s a detached Master Suite. On the second level, there are two Master Suites and a Twin Suite. On the uppermost level, there is a Master Suite and access to the roof terrace. 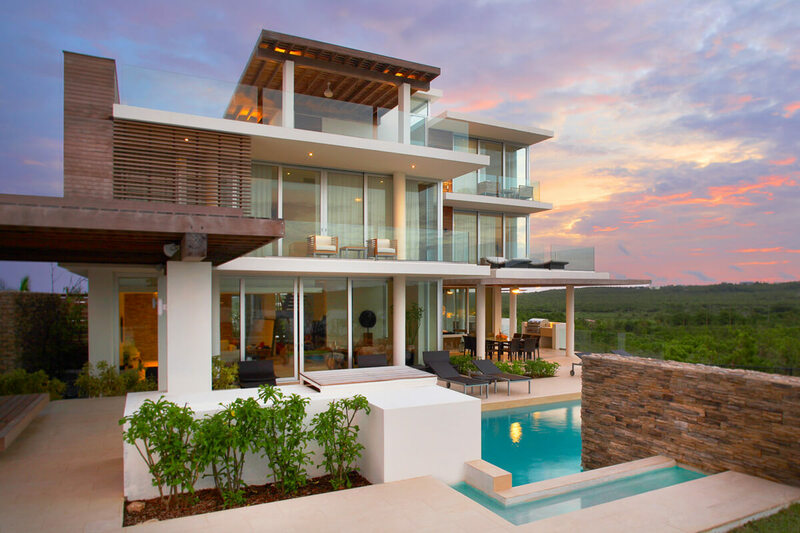 Ani Villa South is minutes from Anguilla’s capital and Crocus Hill. The Viceroy and Cuisinart Resorts are within a 10-minute drive, and Blowing Point Ferry Terminal is also nearby. Gourmet meals including Breakfast and choice of Lunch OR Dinner (Half Board), All-day snacks, cocktail service and Mini bar; Premier spirits, house wines, soft drinks and juices; Beach Butler service — world-class pampering on your choice of Anguilla's divine beaches, totally hassle-free; Full use of the estate's facilities and amenities, including cliff top hot tubs, infinity pools, fitness center, massage treatments (ask for details), pair of 6-seater golf carts; Daily Children's Activity program; tennis lessons and hitting partner, Watersports equipment access (paddle boards, snorkel, etc. ); Mountain bikes; Laundry; Complimentary International calling; High-Speed Wifi; Sonos Music System (Rhapsody) and Unlimited Apple TV and Movie Downloads. Extremely Pleased With This Property and With All Staff. This is a beautiful villa estate with gorgeous views of the ocean and sunset. The staff was above and beyond, very attentive, and blended into the background of our vacation. We would be very happy to stay at this location again. Shawna, as always, is the best. She is professional and always one step ahead of our likes and needs. She makes booking a great vacation an easy process!